MS Paint deprecated; set to die ~ resusciated by outpouring of fans !! On Monday morning, the internet was abuzz with sad news: ‘RIP ~ Paint’ – most media wrote – nothing to do with ‘liquid, liquefiable, or mastic composition that, after application to a substrate in a thin layer, converts to a solid film’. This is about the Paint that every Windows user tried their hand in using and drawing something of their choice !! 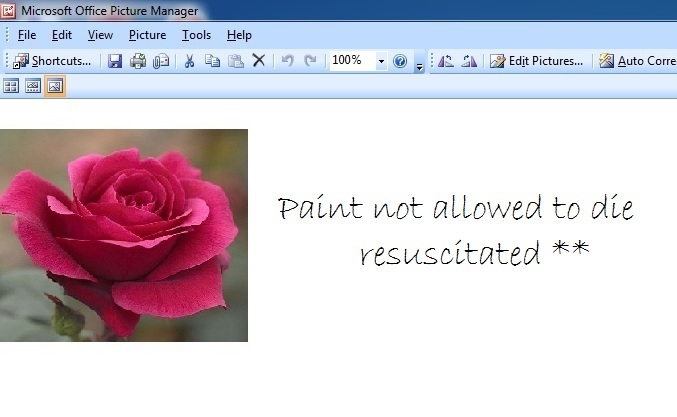 The news was - Microsoft, has announced killing off Paint, the seminal drawing program that has been around since the first release of Windows in 1985. As Obituary was written, readers started writing about their memories of their experiences and one user marked the program’s purported passing with a gravestone seemingly drawn—where else?—in Paint itself. Microsoft Windows, MS Windows or simply Windows, is a metafamily of graphical operating systems developed, marketed, and sold by Microsoft. It consists of several families of operating systems, each of which cater to a certain sector of the computing industry with the OS typically associated with IBM PC compatible architecture. Microsoft introduced an operating environment named Windows on November 20, 1985, as a graphical operating system shell for MS-DOS in response to the growing interest in graphical user interfaces (GUIs). Upon introduction in those days, Windows totally dominated the world's personal computer (PC) market with over 90% market share, overtaking Mac OS, which had been introduced in 1984. For most PC users, Windows is still the most popular operating system. However, in 2014, Microsoft admitted losing the majority of the overall operating system market to Android, because of the massive growth in sales of Android smartphones. In 2014, the number of Windows devices sold was less than 25% that of Android devices sold. This comparison however may not be fully relevant, as the two operating systems traditionally target different platforms. At this juncture, the most recent version of Windows for PCs, tablets, smartphones and embedded devices is Windows 10. Paint (formerly Paintbrush), commonly known as Microsoft Paint or MS Paint, is a simple computer graphics app that has been included with all versions of Microsoft Windows. The app mainly opens and saves files as Windows bitmap (24-bit, 256 color, 16 color, and monochrome, all with the .bmp extension), JPEG, GIF (without animation or transparency. The app can be in color mode or two-color black-and-white, but there is no grayscale mode. For its simplicity, it rapidly became one of the most used applications in the early versions of Windows—introducing many to painting on a computer for the first time—and is still widely used for very simple image manipulation tasks. This Monday, (24.7.2017), Microsoft added Paint to the list of Windows features to be deprecated in the Windows 10 Fall Creator's Update. From its introduction Paint came a long way - Windows 98, Windows 2000 and Windows Me versions of Paint can save images in JPEG, GIF and PNG formats if the necessary Microsoft graphics filters are installed, usually by another Microsoft application such as Microsoft Office or Microsoft PhotoDraw. The most popular application that has come pre-installed on Windows since it was launched in 1985 was about to die or so it was announced. It was a firm staple for children in IT lessons around the world in the 1980s and 1990s. The software was targeted to be one of several features removed in the Windows 10 Creators Update this autumn. Last year, Microsoft introduced a new version called Paint 3D, which included support for 3D objects. Instead of replacing Paint with Paint 3D, Microsoft added a link to Paint 3D in the Home tab of Paint's ribbon. Microsoft announced the list of features that will be killed off in a blog on its website. The firm wrote: 'This list is intended to help customers consider these removals and deprecations for their own planning. 'The list is subject to change and may not include every deprecated feature or functionality.' Other features set to be killed off include the Reader app, Screen saver function and Outlook Express. The news went viral with every media fast writing an obituary to MS Paint ~ the good news came before I could write and post one ! Fans on social media decried the potential death of Paint, which has been in existence for 32 years. That made Microsoft release a blog post stating - "Today, we've seen an incredible outpouring of support and nostalgia around MS Paint. If there's anything we learned, it's that after 32 years, MS Paint has a lot of fans. It's been amazing to see so much love for our trusty old app," Megan Saunders, a general manager at Microsoft, wrote in that blog post. "Amidst today's commentary around MS Paint we wanted to take this opportunity to set the record straight, clear up some confusion and share some good news: MS Paint is here to stay, it will just have a new home soon, in the Windows Store where it will be available for free." So, thanks for all the MS Paint love, keep the feedback coming via the Paint 3D app, and keep creating! To lose was sad ! yet, Mithali Raj & her team can feel proud for the way they played the game. For the first time in 12 years, in front of a capacity crowd at the iconic Lord's and millions more watching back home, India had the ultimate shot at ending their big-moment hoodoo in the grand finals of the ICC Women's World Cup 2017 on Sunday (July 23). The mood in Indian camp was upbeat. They had beaten England so soundly in their opening match and that great innings of Harmanpreet enabled beating mighty Australia too. The team has been performing well. Both captains entered the Lord’s museum with beaming smiles that broke for a moment as they cast their eyes on the trophy to their left before taking their seats to address the media. Of all the collections in all the cricket grounds, this is one that rarely struggles for attention. India’s captain, Mithali Raj, had been calm and composed before this final World Cup match. 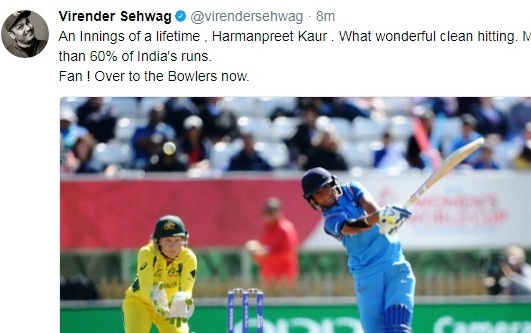 There is not much in the game she has not witnessed in an international career that started in England in 1999 and has seen her amass 228 international caps. Contrast that to England captain Heather Knight, whose 74 ODI appearances at 26 years of age hints at a precocious talent that came good when in fact she is only just getting started. In the end, it was the nerves ~ India looked good after a grand partnership between Punam Raut and Harmanpreet after Mithali was run out. Earlier Smriti Mandhana was out for a duck. Nick-named , 'Hoof' Anya has the ability to swing the ball both ways, it was not much of her swing but her steely nerves and resolve that did the trick. England won the toss and opted to bat. A fine spell by Jhulan Goswami 10-3-23-3; Natali Sciver 51 and Sarah Taylor 45 – England ended up 228/7 and the chase looked gettable. Jhulan had new-ball spell - 5-2-9-0 – keeping England's run rate in check even while their openers scored at eight an over at the other end. Her second - 5-1-14-3 - ripped the heart out of England's innings. Indian chase was in disarray and chaotic towards the end as they finished 219 just 9 short of the target. Punam Raut 86, Harmenpreet 51 and Veda Krishnamurthy 35 scored; Smriti, Jhulan, Sushma and Rajeshwari failed to open their accounts. England’s dreams of victory looked to be slipping away when Poonam Raut was batting brilliantly as India chased 229 to win. But when the 27-year-old opener fell lbw to Shrubsole for 86 the wheels came off the innings. Wickets fell regularly as the pressure grew and when India needed 11 to win from the final 12 balls the match was wide open. Shrubsole had Deepti Sharma caught by Natalie Sciver off the first ball of the penultimate over and then bowled Rajeshwari Gayakwad to give England a famous win. 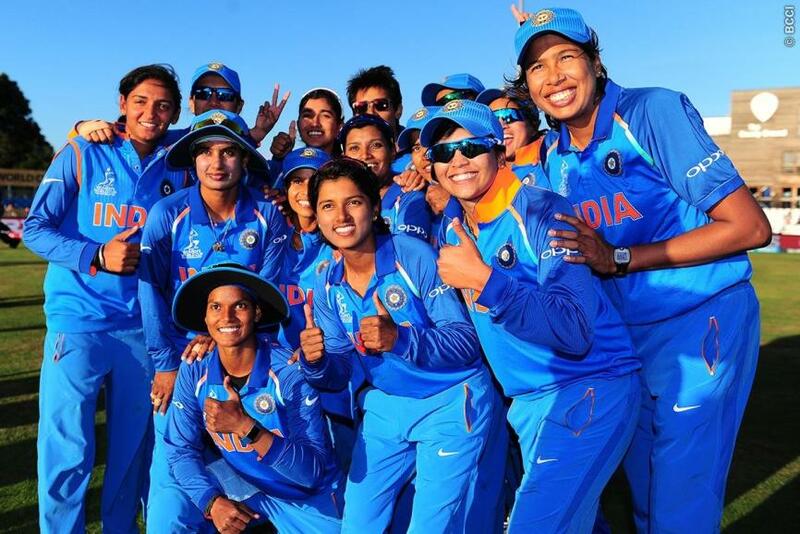 From 138/2 – it was 191/4 and 201/7 – India lost but Indian women stole many a heart by their good performance. For a change, this time, the financial incentive is great, too. The winners take home a cheque of £508,888 (4.25 crores), with the runners-up receiving half as much. The BCCI announced on Saturday that each member of the India team will receive INR 50 lakhs for their performance in the World Cup, regardless of whether they bring home the trophy. 23rd July 2017 @ 10.20 pm. The Indian heartthrob MS Dhoni and Australian legend Matthew Hayden will go head to head in a six-hitting competition before the inaugural TNPL match tomorrow. Both players, who played for the Chennai Super Kings in the IPL, made a name for themselves as big hitters during their respective careers. Tamil Nadu Premier League (TNPL) 2017 commencing today will be a boon to Cricket-starved fans of Chennai - today at Chepauk, the defending champions Albert TuTi Patriots takes on the Dindigul Dragons. A star-studded six-hitting contest ahead of the game will kick off the second edition of the tournament. The competition should be an intense one as Hayden finished his career with an incredible 182 while Dhoni has already scored an astonishing 322 big ones in his career. Besides them, Mohit Sharma, S Badrinath, Pawan Negi, Anirudha Srikkanth will face a bowling machine and attempt to clear the ropes. Chennai sports is not all about Cricket alone ~ there is space for Football, Hockey, Volleyball, Carrom, Kabaddi, Tennis ~ Roberto Bautista, Stan Wawrink, Wawrinka, Janko Tipsarevic, Milos Raonic ~ the recent winners and sadly, none would get added to that list !!! 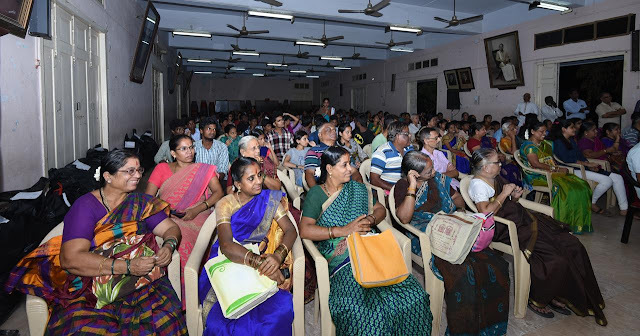 Those of us watching Cricket for decades – have been to MA Chidambaram stadium fondly the Chepauk and many other smaller ones like the Marina stadium, University Union, Gurunanak, AC Tech, India Pistons stadium, Pachaiyappas and more….. places where cricket matches are played. Then there is the famous Nehru stadium [L & T stadium] for all athletic events and indoor games; Egmore Stadium, Rajarathinam stadium and ……… SDAT Tennis Stadium ! 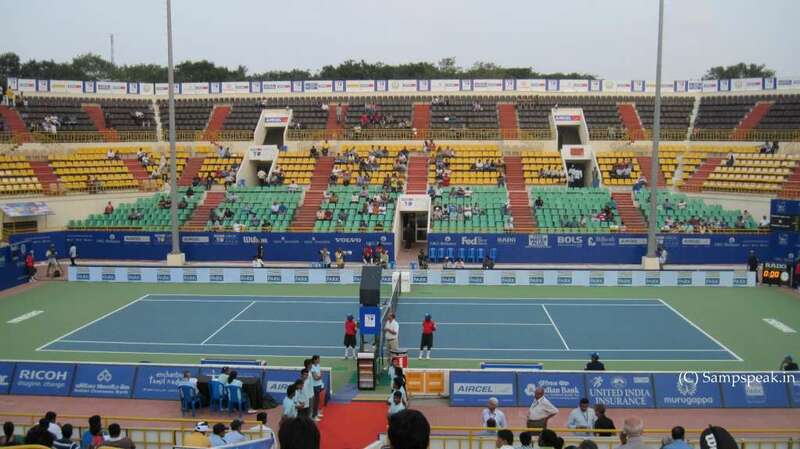 ~ the one built on the occasion of the SAF Games in 1995 by the Tamil Nadu Government that has hosted for 2 decades the Chennai Open tennis event annually since 1997. Tennis is not new to Chennai - John Newcombe in his s autobiography, ‘Life on and off the court’ wrote about playing in 1973 in Davis Cup in Chennai. The early rounds of our Davis Cup campaign under captain Neale Fraser took us to Japan and India. With Rod Laver and Ken Rosewall temporarily unavailable, Mal Anderson, Geoff Masters and I were the singles players, while Geoff and I handled the doubles. Our Cup tie at Chepauk in Madras, southern India, was held in unbelievable temperature regularly over the 40-degree-Celsius mark. After three games you’d be drenched with sweat. Amritrajs were to play them then. For them - the arrival of the Gold Flake Open (later known as Aircel Chennai Open) was a dream come true. For two decades now, Young and old thronged to SDAT Tennis Stadium (also known simply as 'Nungambakkam Stadium'), to watch world-class action. Thomas Enqvist, the winner of the inaugural 1996 edition (held at New Delhi), was the first to make an emotional connect with the public. Yet another Swede, Mikael Tillstrom, then a top-40 player, conquered the arena in 1997. He reserved his best for Chennai summer. 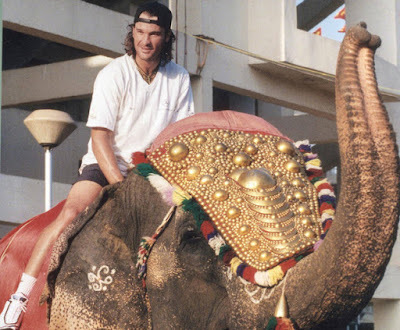 Carlos Moya's love affair with Chennai Open continued for many years. 2003 winner and three-time finalist Paradorn Srichaphan was adopted as Chennai’s son. The talented strokemaker was from Thailand, but fans erased geographical boundaries and embraced him as their own. The Indian interest, meanwhile, was ruled by the doubles combination of Leander Paes and Mahesh Bhupathi. The duo announced their arrival by winning the tournament in 1997. To all the fans, the news came sad - IMG-Reliance, the right holders of the tournament along with Government of Maharashtra and Maharashtra State Lawn Tennis Association (MSLTA), announced this on Wednesday, revealing Pune to be the new city to host the 2018 edition. It will henceforth be called the 'Maharashtra Open'. 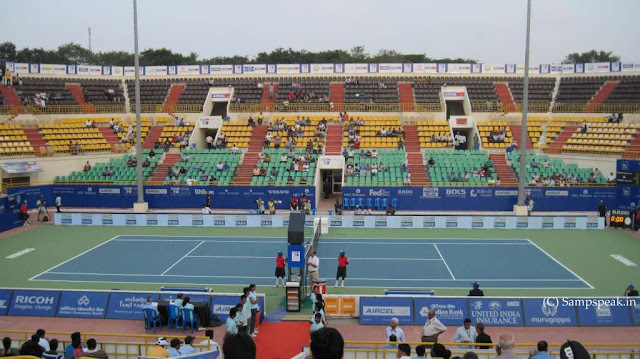 No more ‘Chennai Open’ – the death of a 21 long years of high quality Tennis tournament. With the demise of Chennai chapter, the ATP 250 event, now rechristened 'Maharashtra Open', will be held in Pune in 2018. In a statement, the Tamil Nadu Tennis Association (TNTA) said that they received an email from IMGR cancelling the contract to conduct the event in 2018 and 2019. TNTA further said it would consult its legal counsel and take appropriate action. Aircel Chennai Open, Gold Flake Open and Tata Open had all been its earlier names !~ now it is the shift in venue itself, that leaves Chennai fans saddened. More the reason to follow and cheer for our own Premier league – TNPL. What a night it turned out to be on 20th July 2017 ~ the Indian women excelled with their performance. ~ and it should be another cracker of a contest on Sunday – the finals between England and India. Harmanpreet Kaur played one of the great innings: destructive, breathtaking, and full of class. She also had one of the most epic meltdowns when she thought her partner had been run out – and she did not celebrate her hundered ! 171 from 115 balls, and she finished with an injury. Was limping between the wickets, and didn’t field. After a slow start, her heroinic effort catapulted India to 281-4 in a reduced innings of 42 overs. The next best score was Raj’s 36. The score card finally reads : India women 281 for 4 (Kaur 171*, Raj 36) beat Australia women(Blackwell 90, Villani 75, Deepti 3-59) by 36 runs ~ but there was so much of drama in between, most enjoyable from Indian angle. A perfect restart for India followed. Australia were pegged three times in the opening eight overs, Jhulan Goswami removed the consistent Aussie Meg Lanning for her first duck since August 2014 with the ball of the tournament (angling in, before leaving the right-hander for dead and clipping her off stump). Ellyse Perry and Elyse Villani fought back. Villani led the charge in a century partnership off 89 balls in which the second 50 took 39. When Villani was dismissed for 75 – a career best – and Perry and Alyssa Healy followed in 33 balls, India were back in control. The game looked well set for India at that point, with Australia requiring 113 from the final 57 balls. Alex Blackwell disagreed. Aged 33, this may well be her last World Cup and she marshalled the No11, Kristen Beams, expertly while bringing up a half-century from 36 balls, which included six fours and, at the end of the 35th over, the first six of the Australia innings. She went on to hit two more huge sixes down the ground and five more fours. But, on 90, with 37 needed from the final 12 balls, she was bowled by Sharma to hand India victory. She contributed 65 to the last-wicket stand of 76, which is a record for the 10th wicket in women’s ODIs. But that is a dull silver lining to a second world tournament in as many years that Australia have left empty-handed. Mr Ramnath Kovind is the new President elect - Greetings !! India has elected ~ may not be, We, the people of India – Mr Ram Nath Kovind is the new President elect. 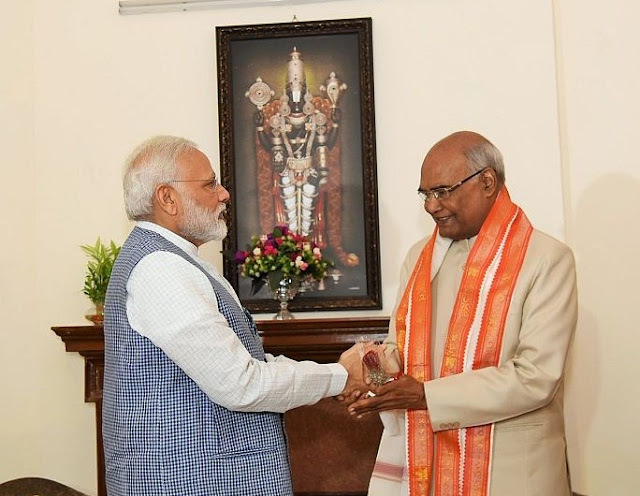 He has defeated Opposition’s candidate Meira Kumar by a huge margin to officially become the 14th President of India. Before we read further, do you know or remember Prof KT Shah and his fling at President’s chair ? Polling to choose the 14th President of Indiaas the incumbent President Pranab Mukherjee demits office on 24 July, was held simultaneously at 32 polling stations – one in Parliament House and one each in 29 state assemblies and two union territories with assemblies. LokSabha Secretary General Anoop Mishra is the Returning Officer for the election, and will issue the certificate to the winning candidate. The President of India is indirectly elected by an electoral college consisting of the elected members of both houses of parliament, the elected members of the Legislative assemblies of the 29 states and the elected members of the legislative assemblies of the Union Territories of Delhi and Puducherry. As of 2017, the electoral college comprised of 776 MPs and 4,120 MLAs. There have been 13 presidents of India since the introduction of the post in 1950(the current tenure is 5 years of an Indian President). 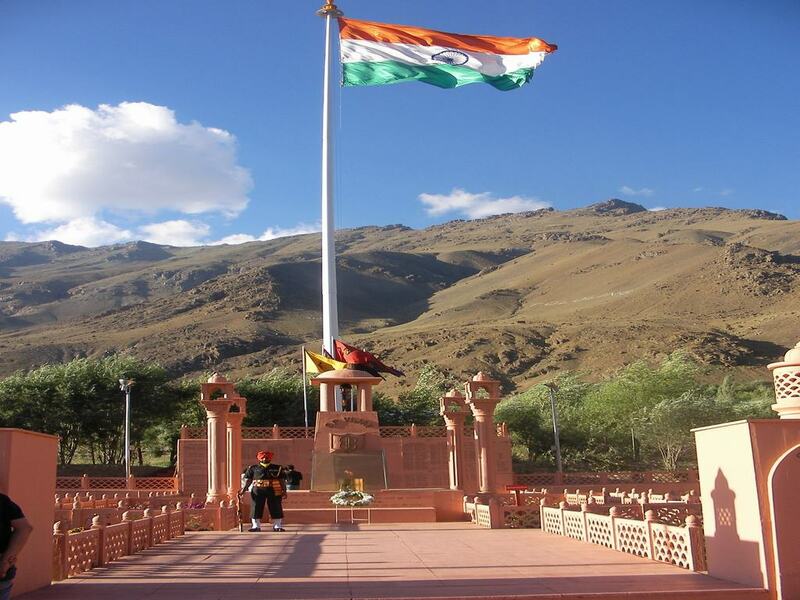 The post was established when India was declared as a Republic with the adoption of the Indian constitution. Apart from these thirteen, three acting presidents have also been in office for short periods of time. VarahagiriVenkataGiri became Acting President of India in 1969 following the death of ZakirHussain, who died in office. Giri was elected President a few months later. He remains the only person to have held office both as a president and acting president. Rajendra Prasad, the first President of India, is the only person to have held office for two terms. A total of 4,896 voters – 4,120 MLAs and 776 elected MPs – were eligible to cast their ballot. MLCs of states with legislative council are not part of the electoral college.While the value of an MLA's vote depends on the population of the state he or she belongs to, the value of an MP's vote is the same at 708. The breakup of 4,896 members is - 543 Members of LokSabha, 233 Members of RajyaSabha and 4120 members of State Assemblies. While the LokSabha Speaker, an elected member, can vote, the two nominated members in the Lower House from the Anglo-Indian community cannot. Twelve nominated members in RajyaSabha are also ineligible to vote. It is not equal. Each MP and MLA vote has a certain value attached to it. And this value differs from state to state. Each MP’s vote is 708 : 708 x 776 = 5,49,408. The votes of MLAs (4896) totals the same 5,49,408 = 10,98,903. The winner needs to secure 50% of valid votes polled. The First Presidential Elections in free India were held on 2nd May 1952. Dr. Rajendra Prasad won his first election with 507,400 votes over his nearest rival K. T. Shah who got 92,827 votes. There were other contenders too :Thatte Lakshman Ganesh (2672); ChowdhryHari Ram (1954) and Krishna Kumar Chatterjee (533).. Prof K.T. Shah was known for his active role in the Constituent Assembly (General, Bihar) responsible for framing of the Indian Constitution. An alumnus of the London School of Economics, he was a socialist leader, he was the runner-up in 1st Presidential election in India. Good Morning wishes *** Today, it is focussed on SYMA ~ the Organisation that I have been writing about for many years now, being the Secretary. It is all about about SYMA’s Educational Aid function held on 8th July 2017 and seeking your financial support for the same. Please do read this – together we will change the way some students attend school. July is a very important month for SYMA - our Educational Aid function, was held on 8th July 2017 at NKT National Girls High School. 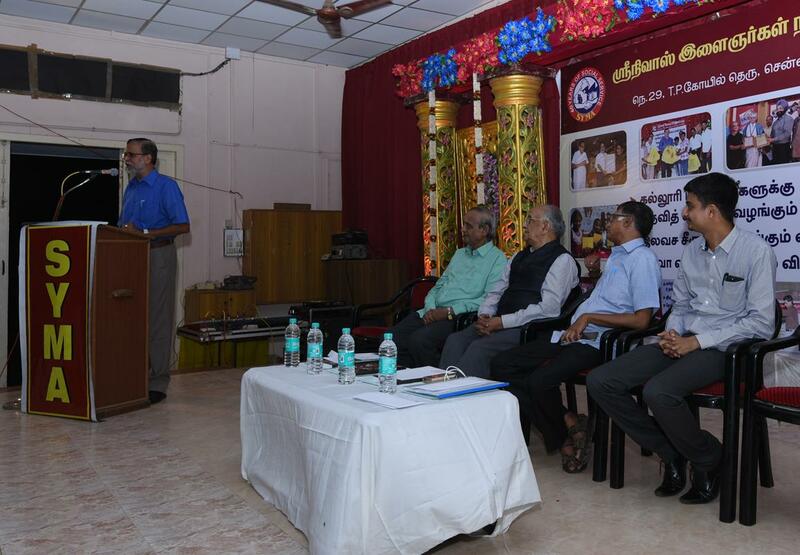 We had extremely distinguished Chief Guests Mr TS Krishnamurthy and Dr K Sridhar. Shri. T. S. KrishnaMurthy, would require no introduction having served as the Chief Election Commissioner overseeing the Lok Sabha elections in 2004. He holds a bachelor’s degrees in economics from University of Mysore and in law from the University of Madras. He also holds a master’s degree in fiscal studies from the University of Bath, U.K. Besides, CEC, he served as the Chief Commissioner of Income Tax, Secretary to the Government of India - Department of Company Affairs, Additional Secretary – Department of Expenditure, Ministry of Finance. 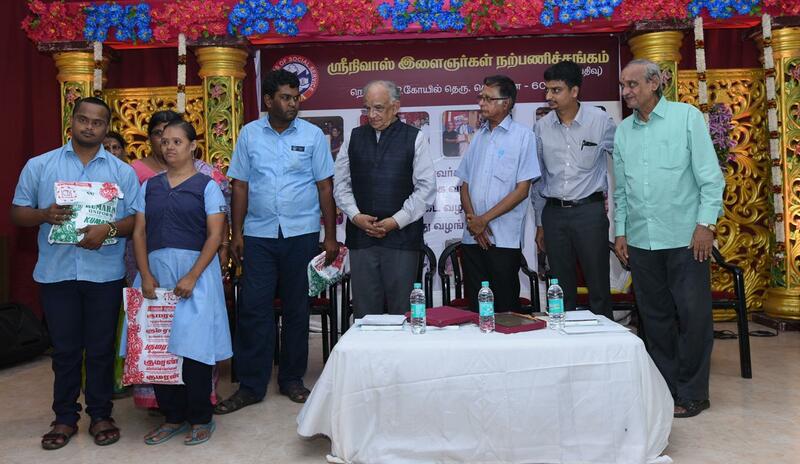 Dr. K Sridhar has always been close to us ~ the person instrumental in making SYMA do medical service for over 27 years now. Presently, he is Sr. Vice President - Medical & Director - Plastic Surgery. Dr Sridhar, MBBS, MS, MCH, graduated from Kasturba medical College Manipal, pursued his masters in General Surgery from the same college. He worked for a year at VHS Adayar as an assistant surgeon following which he joined Mch in Plastic Surgery at Government Stanley medical College and Hospital. The renowned Plastic Surgeon has travelled widely delivering lectures in Seminars and has a great passion for helping poor and doing social service. We are proud to be associated with him having him as our mentor. Srinivas Youngmen's Association popularly (SYMA) has been rendering social service from 1977. We are registered with the Registrar of Societies. With care and concern for the society, we have been actively involved in social service doing multifarious activities which include – coordination with civic authorities in keeping the environ clean, conducting health campaigns – promoting health care and hygiene; organizing Eye Camps, Blood Camps and other camps. In our earnest effort to improve the competitive spirit and to instill confidence in school children, We have been conducting Child Fest every year in which more than 4000 students from around 100 city schools participate. 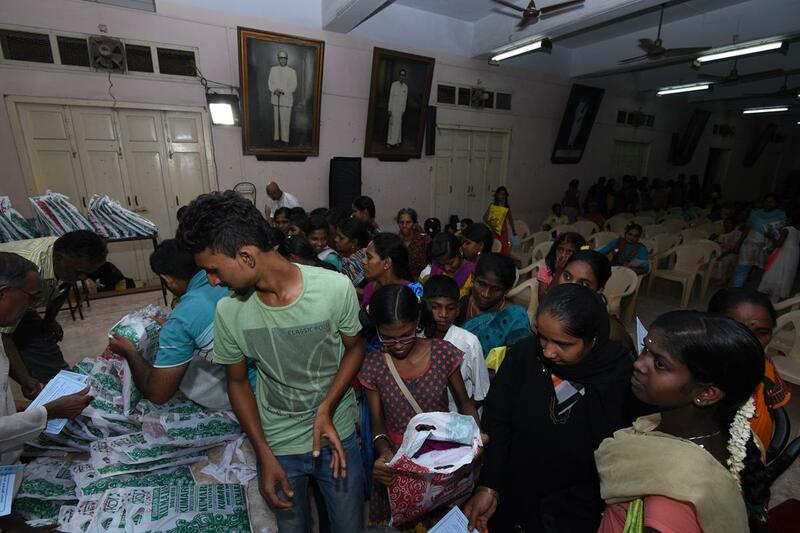 1) Medical Centre and Laboratory run for the poor wherein free consultation and medicines are provided – popularly known as ரெண்டு ரூவா மருத்துவமனை [Rs. 2 hospital !] This functions between 5 – 7 pm on all days except Sundays and National holidays. Consultation is free and medicines too – provided through regular medical shops with whom we have working arrangement. Around 40 – 50 people utilize this daily. We also have a Medical lab wherein blood and other tests are done at very nominal costs. The running of Medical Centre and Lab costs around Rs.25000/- per month. 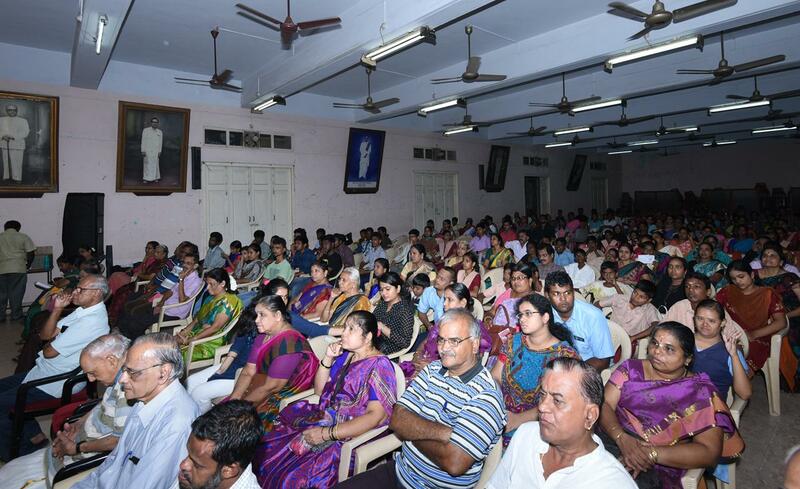 2) SYMA Growth – a purposeful special tuition centre for coaching poor students of 10th and 12th standards. Into its 10th year now, this was inaugurated in 2008 and producing good results year after year, changing the lives of poor children. This year we have X Std English medium; X Tamil medium; + 2 Science Group and +2 Commerce Group. 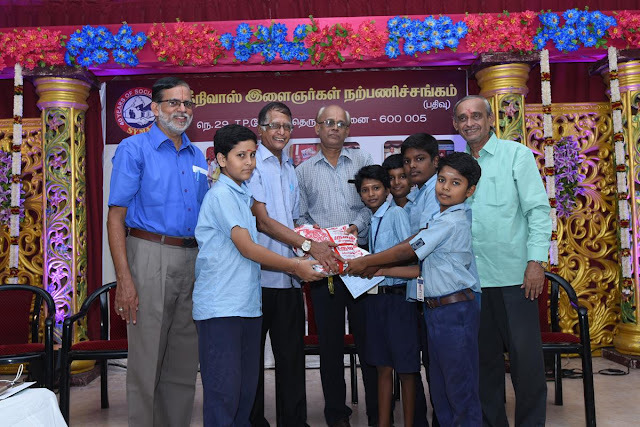 Every year, we educate around 130 students selected from weaker sections of the society and that way perhaps we have touched the lives of more than 1000 poor students. 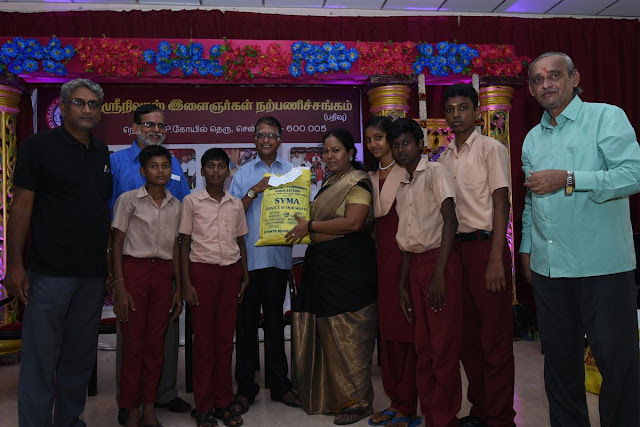 Through this project we aim to provide quality educational support to students who would otherwise will have no opportunity to such quality education. Education is imparted through qualified senior teaching professionals who are paid nominal fees by us. Classes are conducted on all days of the week. We have created an excellent infrastructure and have dedicated staff for this. The classes are conducted at the premises of National Boys High School, Triplicane for which we pay a nominal rent and some amount towards electricity and other expenses. The project expenditure of our Tuition centre is around Rs. 7.5 lakhs lakhs per year, which for the Educational year 2017-18 is fully sponsored by ManpowerGroup, to whom, we express our deep gratitude. 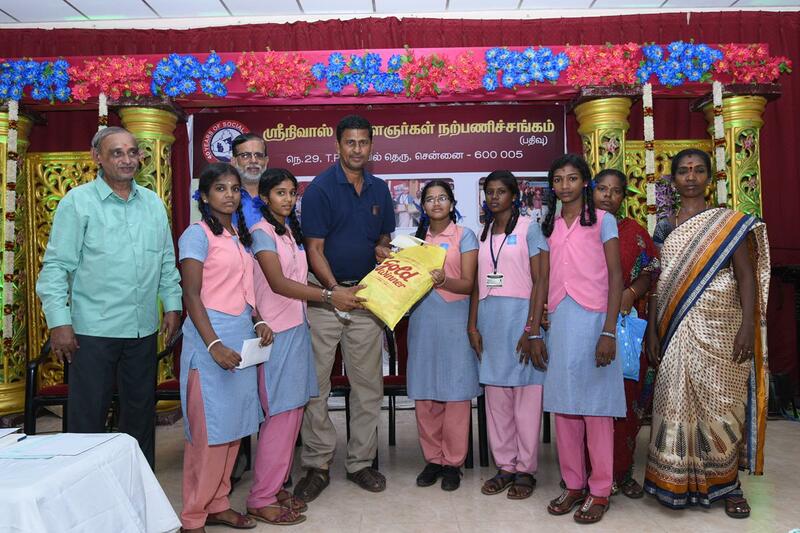 In the Educational Aid Function conducted now, we provided more than 1000 sets of unstitched uniforms to poor students. In the Educational Aid function, We also provided financial assistance to select college students, and honoured School toppers of various Schools in Triplicane. Every year we recognize some silent achievers of the Society and this year too we presented SYMA Seva Award to a woman who has been specializing in communication skills to intellectually challenged. Generally, we collect funds in the months of July & ahead coinciding with our Educational Aid Programme, though donations are welcome throughout the year. You have patronized us in a big way in the past, and we look forward to receiving your donations this year too. 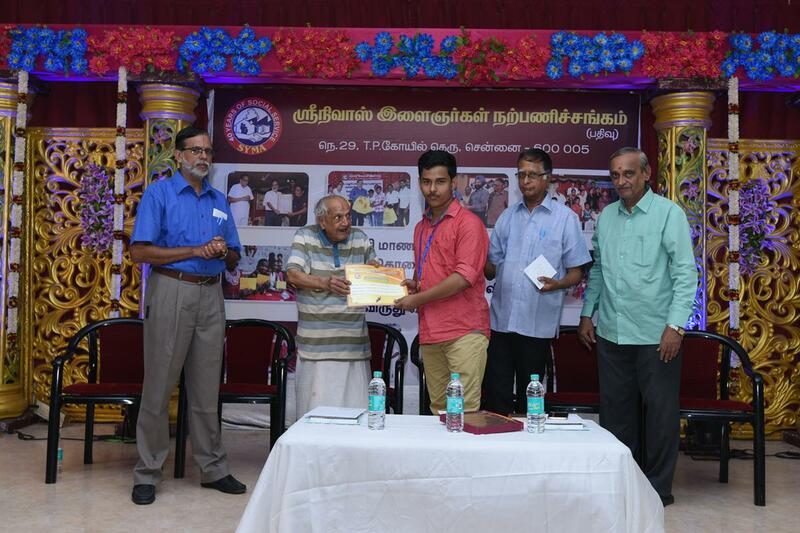 Cheques are to be drawn in the name of ‘SRINIVAS YOUNGMENS ASSOCIATION’ – payable at Chennai. In case any donor wishes to make a Bank transfer, we will provide details of our Bank A/c on request. Contributions to SYMA are eligible for deduction under Sec 80G (5) (vi)of Income Tax Act, as applicable. Here are the details of our Current Account with Punjab National Bank. A/c No. 0346002100024570, Triplicane Branch, Singarachari St. Triplicane, Chennai - 600 005.
or email us at : srinivasyoungmensassociation@yahoo.co.in. Some photos of the Educational function is enclosed. A brief report on the Function will feature later. ICC Womens World Cup 2017 ~ Highest run scorer, Wicket taker and victims are Indians !! She has played 2 Tests and 98 ODIs ; 68 T20s – scored 2408 ODI runs and has 42 stumpings and 95 catches in ODI. Her name would immediately make you think of Saamy heroine. The ICC Womens’ World Cup has been exciting. SA has choked again; England has marched to Finals and wait the outcome of India Australia match at Derby tomorrow. In this WC Indian Capt. Mithali Raj has rewritten the all-time batting record and Jhulan Goswami the all-time bowling record; Trisha Chetty added her name to the leaderboards when in Taunton earlier this week she rose to top spot for most wicket-keeper dismissals in women’s One-Day Internationals when Chamari Polgampola edged Dane van Niekerk to her gloved hands. 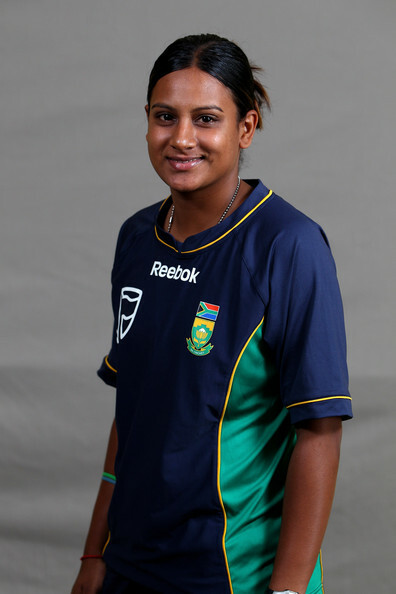 She is of Indian origin but plays for South Africa. Moments after the final of 2017 edition Indian Premier League between Rising Pune Supergiant and Mumbai Indians was concluded, Chennai Super Kings franchise announced their return to the league and social media just exploded. Chennai fans have been starved off International cricket, no matches being played at Chepauk, and most of us are eagerly awaiting TNPL about to start in a couple of days. CSK along with Rajasthan Royals were in July 2015 suspended from the cash-rich league in a clean-up exercise following the 2013 betting and spot-fixing scandal. India offspinner R Ashwin has waded into controversy by comparing Chennai Super Kings' return to the IPL fold to Manchester United's recovery from the horrific plane crash at Munich in 1958, in which 23 people including eight of their footballers died. The Manchester United squad had been returning home from a European Cup tie in Belgrade on February 6, 1958 when their British European Airways flight crashed on take-off following a refuelling stop. Ashwin subsequently took to Twitter to clarify his position, claiming his comments had been taken out of context. Out there in UK, a week ago, when India went down to Australia by eight wickets, the odds in favour of the two teams facing each other a second time this World Cup were seemingly low. While Australia had sealed a semi-final berth at a canter, India's fate was to be decided by a knock-out tie against New Zealand. In what turned out to be their most comprehensive victory in the tournament, a century from captain Mithali Raj, coupled with Veda Krishnamurthy's 45-ball 70, marshalled India to their fourth semi-final appearance in ten editions and their first since 2005, when they finished runners-up. India is expecting that opener Smriti Mandhana, who got India's campaign off to a flying start with a 90 and a hundred in consecutive games, would fire again in the possible 2 matches along with Punam Raut. Mithali Raj's partnerships with Raut, Harmanpreet Kaur, Krishnamurthy and Deepti Sharma have been vital to India's totals, as have been her 356 runs at an average of 50.85, that contributed to her becoming the first Indian to score 1000 runs in the World Cup. India would look forward to its spinners too ..
Trisha Chetty has been playing since her young age and is reportedly an avid fan of Jonty Rhodes. Chetty followed a fairly regular route through the ranks, from junior cricket to provincial cricket and the national team. She made her international debut as an 18-year-old and batted at No. 6 in that match. Less than 18 months later, she moved to the top of the order, in a one-off match against Ireland. That's where she stayed until recently. Unlike modern wicketkeepers who consider themselves batsmen who can keep, Chetty sees herself primarily as a wicketkeeper. It has helped that she's had one of the best in the world to look up to. "I loved Mark Boucher's style," Chetty says. "I wanted to be just like him. Just everything about the way he did things and his rhythm in keeping." Last year, Cricket South Africa suspended two of its three Indian-origin players in the national women’s squad – Shabnim Ismail and Trisha Chetty – for repeat offences that breached its Rules and Code of Conduct. Ismail and Chetty were suspended until January 31 for persistent breaches of Article 1.5.2 of the Code, namely “unbecoming or detrimental conduct which could bring them, the Board or the game of cricket into disrepute”. Although CSA would not give details of the nature of the offences, sources said the two players were at loggerheads ! So tomorrow let us all cheer for our side to win the match reach the finals and win the Cup too. Hearty wishes to Mithali Raj and our team India. After a long tour of India, England landed in Sri Lanka and on a Wednesday, Feb 17, 1982, when Bob Willis ran his long steps and bowled to Bandula Warnapura, Sri Lanka became cricket's eighth Test-playing country. Minutes earlier, Warnapura had become the first Sri Lanka captain to win a toss; minutes later, he was their first batsman to be dismissed when he was taken high in the gully by David Gower off a Willis snorter for 2. Lot of things happened thereafter too as - Bandula Warnapura captained a rebel Sri Lankan side to South Africa and received a life ban from cricket as a result. The English Captain Keith Fletcher never played for England again and was replaced as captain by Bob Willis. Today, Rangana Herath was just named Player of the Series ! - for a one-match series, and another hero was Player of the match - Downdegedara Asela Sampath Gunaratne. History would otherwise have been made ~ Sri Lanka denied Zimbabwe their first Test series away win in 16 years by chasing down a record-breaking 388 to win the one-off Test by four wickets in Colombo. 16 off the last over would be a daunting enough challenge even in a Twenty20 chase. Sixteen an over for the final three overs is something else entirely. And yet in Feb this year at Simonds Stadium, Geelong, Victoria, Australia's captain, Aaron Finch, said he felt that while Asela Gunaratne remained at the crease, Sri Lanka still had a chance of achieving their goal, an assessment that turned out to be accurate, to the delight of thousands of Sri Lankan fans at Geelong's Kardinia Oval. Gunaratne took 12 off James Faulkner, then 22 off Moises Henriques, and the 14 that Sri Lanka then needed off the final over from Andrew Tye were completed when Gunaratne crunched the last ball over cover for four. After that innings – it was apparent that he will be featured in IPL and Mumbai Indians picked him for Rs. 30 lakhs ! 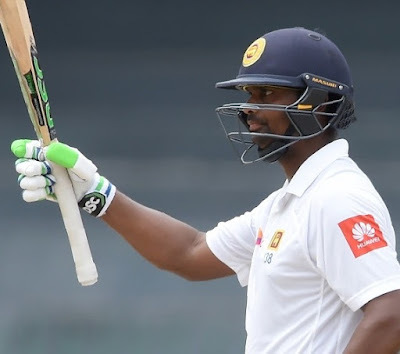 ~ he is hailed in Lanka today ..
Niroshan Dickwella has played more Tests, but during the 121-run stand that turned the match, it was Asela Gunaratne who found himself constantly pestered for advice. Sri Lanka had been five-down and 185 runs short of their target when the two came together. Dickwella played aggressively through the partnership, and helped ensure some of the pressure Zimbabwe had exerted, was reversed. Niroshan Dickwella (81) and Asela Gunaratne (80 not out) shared a sixth-wicket century partnership to help Dinesh Chandimal’s side complete the highest fourth-innings chase in Sri Lanka – beating Pakistan’s 382 for three two years ago. It was also the highest successful run chase in Sri Lanka’s Test history, and the fifth highest ever by any nation. Followers of the game would well remember that great match for India in Apr 1976 at Queens Park Oval, Port of Spain, Trinidad. India came to the third Test after being outplayed in the first match of the four-Test series at Barbados. They had come close to winning the drawn second Test at the Queen's Park Oval, and when the third Test, scheduled to be played in Guyana, was rained off and the venue shifted back to Trinidad, they felt that they were in with a chance. Clive Lloyd believing his pacers set a target of 403, India lost only two wickets - Anshuman Gaekwad and Gavaskar - to the bowlers; the two others, Gundappa Viswanath and Mohinder Amarnath were run-out. Sunil Gavaskar and Mohinder Amarnath put on 108 - patient and studious. When Gavaskar got out scoring 102, Viswanath matched his supple grace with the bold outline of Amarnath's strokes in a stand of 159 to carry India to 292 for two by tea. Driven to despair by the failure of his spinners, Lloyd claimed the second new ball. It fared no better than the old, as 37 came from the eight overs shared by Bernard Julien and Michael Holding. Gundappa Viswanath made his fourth Test century but lost his wicket when there were 70 runs left, Brijesh Patel ahead of Eknath Solkar. It was a moment to savour as India successfully chased a mammoth score. Today there had only been 4 higher targets successfully chased in Tests. The 388 that Sri Lanka chased down in this match is the highest any team has successfully chased in Asia. The previous highest in Asia was India's chase of 387 against England in Chennai in 2008. 87.3 Overs sent down by Cremer in this match - the most by any Zimbabwe bowler in Tests. A late bloomer, the Sri Lankan Army man, Asela Gunaratne piled up several impressive seasons for Sri Lanka Army Sports Club before making his international debut at the age of 30 against Zimbabwe in a Test match in 2016. He scored a fifty in the first innings of the first Test and went on to score his maiden Test century in the second match of the same tour. Earlier this year, Gunaratne scored his maiden ODI century against South Africa at Centurion. His purple patch continued as he hit back-to-back fifties against Australia to ensure the Lankans triumphed in the T20I series against Australia, in Australia. Today’s match was played at R.Premadasa Stadium, Colombo named after Former Sri Lanka president Ranasinghe Premadasa. The stadium was his idea and when finished it was named Khettarama Stadium as it was adjacent to the Khettarama Temple. The President gave a swampland to build a stadium and in Feb 1986 a huge 14, 000 seater concrete stadium was built. It was only after the assassination of Ranasinghe Premadasa in May 1993, the stadium was renamed after him. In 1983 WC Group match, England swamped Lanka. Ashantha de Mel, easily Sri Lanka’s bowler of the tournament, had Chris Tavare caught-behind — though not before he had raced to a 48-ball 19, which was certainly express by his standards. Graeme Fowler (81 not out from 77 balls) and an in-form David Gower (27 not out from 24 balls) went after the bowling, and the target was chased down with more than 35 overs to spare. But when the awards were presented, Fowler it was not; neither did Allott (three for 41), Botham (two for 12), Vic Marks (two for 18), or Cowans (two for 31). Instead, Willis was called on to receive the award — not for his economic spell of 9-4-9-1 but because of his bowling changes and immaculate field placements. Years later in June 2001, the tall West Indian fast bowler Cameron Cuffy, was given the award for a tight spell of bowling in Harare in June 2001. Cuffy delivered his quota unchanged at the start of Zimbabwe's innings, finishing with figures of 10-2-20-0 (and didn't bat or take a catch).